DIPLOMATIC relations between Russia and the West are now the coolest they have been since the Cold War, and recent international controversies have loomed large over Limerick’s links to Russian trade. In the meantime, across the Atlantic, Donald Trump has just introduced steel and aluminium tariffs – but the president has temporarily exempted the EU from these new measures. But what could these international developments mean for one of Europe’s largest aluminium producers, Limerick’s very own Aughinish Alumina? Employees, for one, will be hoping for no negative consequences. Aughinish, owned by Russian company Rusal, was raised in a conversation between Taoiseach Leo Varadkar and British Prime Minister Theresa May, the Dáil heard last week. The Taoiseach had been discussing US trade issues with Mrs May, he told deputies. “While Ireland is not a steel producer, we account for approximately 30 percent of all aluminium produced in the EU at Rusal Aughinish,” said Mr Varadkar. “Although very little of this is traded with the US, any tariffs will impact global commodity prices, and we were pleased at the White House decision to exempt the EU from the tariffs until May,” he added. 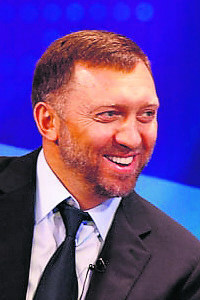 Russian billionaire Oleg Deripaska owns the controlling stake in Rusal. The oligarch is known for his close ties with Russian president Vladimir Putin. The Aughinish owner was named on a US list earlier this year, which profiled Kremlin-linked members of the Russian business class, potentially singling them out for potential new sanctions. Deripaska was among 96 wealthy Russians published on the watch list, called ‘Countering America’s Adversaries Through Sanctions Act’, which identified allies of Putin. It does not necessarily mean that they will face sanctions. But a number of weeks later, Mr Deripaska stepped down from his management role as president of Rusal. The oligarch is also a “person of interest in the Russian election-hacking investigation” due to his business ties with former Trump campaign manager Paul Manafort, according to Forbes. The poisoning of a former spy and his daughter in Britain one month ago triggered a chain of international events, amid suspicions that the Kremlin was behind it. A Russian diplomat in Dublin was sent home, while an Irish diplomat who was based in Moscow is now receiving the same treatment. But despite the cool breeze between Europe and Russia, the Department of Foreign Affairs and Trade this week moved to reassure those who rely on Russian industry. “There is no reason to believe that our trade and economic relations with Russia will be affected by recent events,” said a spokesperson from the department in a statement to the Limerick Leader.